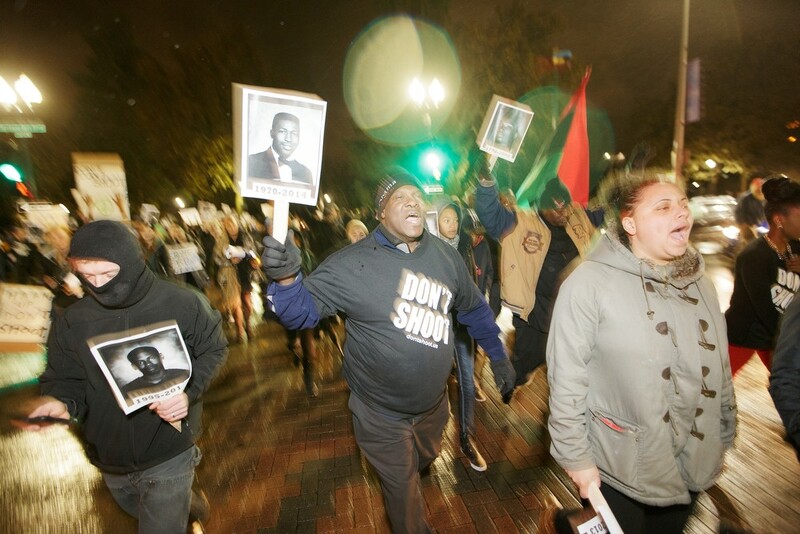 More than 200 people attended Solidarity Action for Ferguson march and rally last night in response to Ferguson Police Officer Darren Wilson not being indicted for the shooting and killing of unarmed teenager Michael Brown. 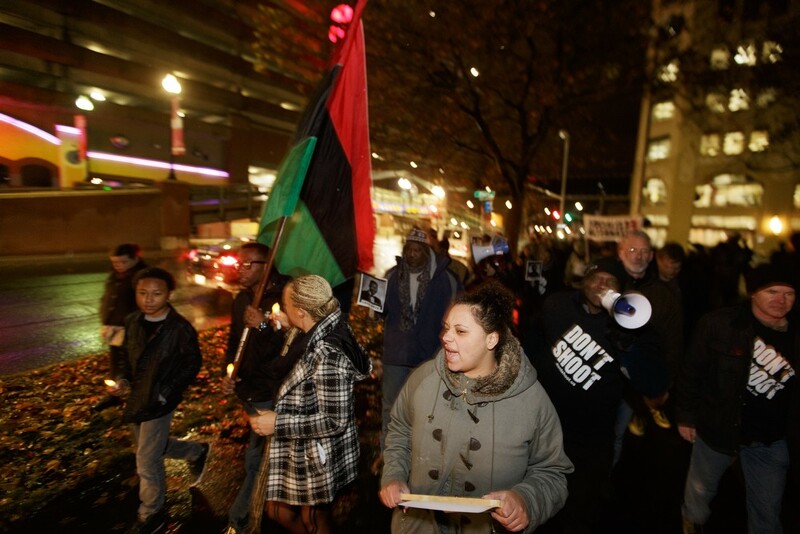 After a "die-in" in front of Spokane City Hall, symbolizing Brown's body being left in the street for hours after his death, marchers walked from City Hall to the STA Plaza and back chanting "no justice, no peace" and "hands up, don't shoot," among others. Local NAACP chapter President and Inlander commentary contributor Rachel Dolezal, left, draws a chalk outline around her 20-year-old son Isaiah Dolezal as part of a "die-in" in front of City Hall. Jackie Vaughn, bottom, walks down W. Spokane Falls Blvd. 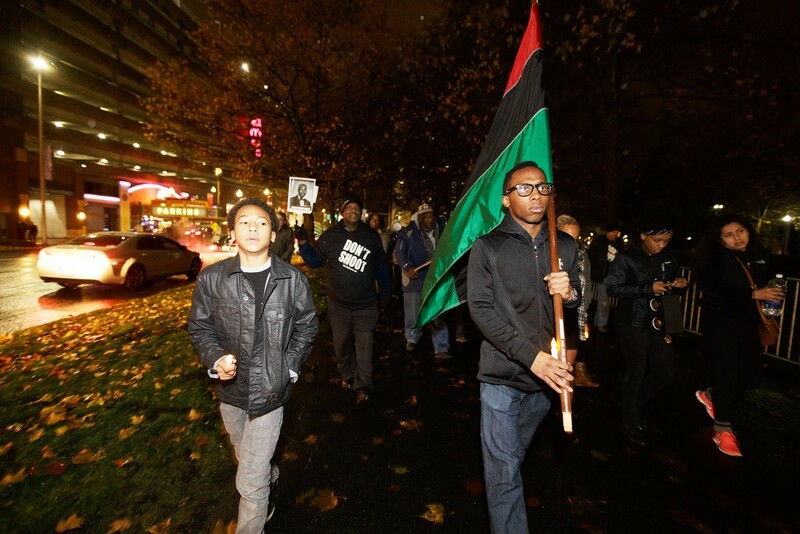 Twenty-year-old Isaiah Dolezal, right, carries a Pan-African flag as his 13-year-old brother Franklin Moore walks along his side down W. Spokane Falls Blvd. Fred Ward, center, Jackie Vaughn, right, and others walk down N. Wall St.